PTI Baseball is a proud National Scouting source of the Power-Showcase. POWER SHOWCASE participants must achieve and maintain a high-level academic status, while possessing the redeeming leadership qualities and determination that exemplify respect in keeping with the game of baseball. To participate in this event, share your information with us, send us link to videos and we will get you into the power showcase in Marlins Park in Miami! 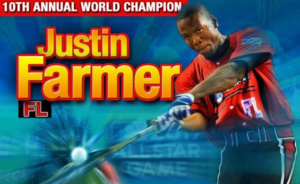 Justin Farmer, who came up with the PTI Baseball organization competed with the best players in the world and brought home the 10th Annual World Championship award. PTI’s Eddie and Jerry Gonzalez are a huge part of the power showcase and help players world wide get noticed. Day 1 – will consist of a MLB Pro Scout Day in front of every MLB Organizations scout, and later in the evening is the Welcome Dinner and Jersey Presentation Ceremony. Days 2 & 3 are comprised of the legendary POWER SHOWCASE Home Run Derby for the three age groups. The three finalists from the featured and underclassmen group will advance to the finals on Sunday. During the final round, the players will receive 15 outs with the option of using their bat of choice, wood or metal. The player who hits the most home runs during the Championship Round with be crowned the 2016 POWER SHOWCASE World Champion. Day 4 – To reiterate; after the completion of the Pro Scout Day, two days of the preliminary rounds of the home run derby, the last day will feature the three games and the crowning of the 2016 POWER SHOWCASE World Champion.